As the name suggests it, freshwater pearls are the only type of pearls that grow in fresh waters. They are also the most diverse pearls as you can find them in many sizes, shapes, and colors. But which freshwater pearls are right for you? When buying these semi precious gemstones, what should you look for? Read further to discover the answers to these questions and learn everything you need to know before buying freshwater pearl jewelry. How do freshwater pearls grow? You probably know the difference between cultured and wild pearls from our previous articles, but, for those of you who are new to Ana Luisa’s universe, we are going to make a quick recap. The only difference between cultured and wild pearls is where they grow. There is no other difference. Both types are natural, come from oysters and have the same properties. Wild pearls grow in oysters that live in the ocean, while cultured pearls grow inside oysters in special farms. As you know, the pearl inside the oyster is the result of an irritant, usually a shell piece. When it enters the oyster, this irritant prompts it to protect itself by secreting a substance that hardness into a pearl. Most of the oysters in the oceans live their lives happily ever after without encountering any irritant. That’s why wild pearls are an accident and, as a result, very rare. When it comes to the oysters in special farms, people surgically insert the irritant to control the pearl creation process. Coming back to freshwater pearls, they are the only type that grows in fresh waters in mussels. The other types of cultured pearls (Akoya, Tahitian & South Sea) grow in saltwater. As opposed to the saltwater types where the irritant is a shell piece, in freshwater pearls, the irritant is composed of 24 to 32 microscopic mantle tissue pieces. For the next 2 to 7 years, the mussel will deposit layers of nacre and, in the end, produce approximately two dozen freshwater pearls. How are freshwater pearls different from saltwater ones? Besides the growing and farming process, freshwater pearls also present other differences when compared to saltwater pearls. First of all, they are rarely perfectly round. Usually, freshwater pearls are freeform or baroque. Secondly, they come in a greater diversity of colors than any other pearl type. And last, but not least, their luster is different from saltwater pearls. Instead of the glossy, mirror-like finish, their luster is warmer and offers a soft glow. Before buying freshwater pearls, you need to know a couple of things about their sizes, colors, shape, and value. Just read further to understand what to look for when buying freshwater pearls. Usually larger than Akoya pearls and smaller than South Sea & Tahitian pearls, the freshwater variety has the widest size range. You can find freshwater pearls with sizes ranging from 2 to 15 mm. Just for you to get an idea, Akoya pearls can be between 5 to 10 mm, Tahitian ones between 8 and 21 mm, while South Sea pearls have sizes ranging from 8 to 20 mm. Besides producing the widest array of sizes, freshwater pearls also have the widest range of colors. They can be lavender, white, peach (or even black when dyed) and have overtones like pink, aquamarine, green, ivory, silver, and rose. Because of their wide range of colors, freshwater pearls are ideal for crafting multi-colored pearl necklaces. As we said in the beginning, freshwater pearls come in many shapes, but they are rarely perfectly round. They can be rice-shaped, button, drop, coin-shaped, off-round as well as oval, baroque or simply freeform. However, if you are looking for round freshwater pearls, know that you can find them, but expect to pay more for this type. A-AAA quality. This means that the pearls are near perfectly round, with excellent luster and a blemish rate between 0 to 5%. 0.03% of the freshwater pearls each year receive this grade. AAA quality. 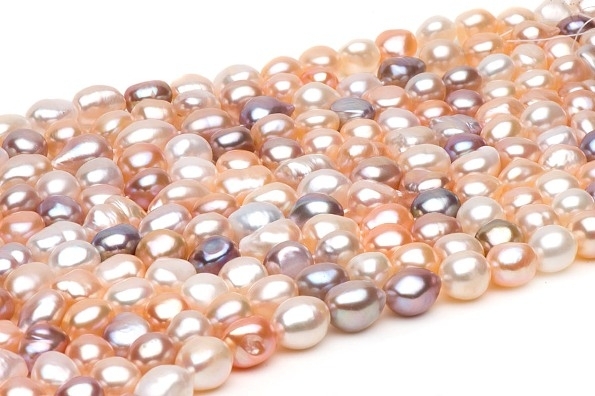 These pearls are mostly round, feature a satin luster and present blemishes of 5% of the surface of each pearl. 1% if the freshwater pearls each year receive this grade. AA+ quality. With 5% of pearl harvest each year receiving this grade, these pearls are slightly off-round, have good luster and 5 to 10% blemishes. AA quality. The pearls in this category represent 10% of the harvest each year, feature a fair luster with some blurring around the edges and present less than 20% blemishes. A quality. These are the most common freshwater pearls harvested each year. They don’t have a powerful luster, but rather a subtle glow. They can be any form but, in order to be accepted, they need to present less than 50% blemishes. If you enjoyed reading this article, check out what else we have in store for you. Visit Ana Luisa online jewelry shop to discover our fabulous pearl earrings collections.